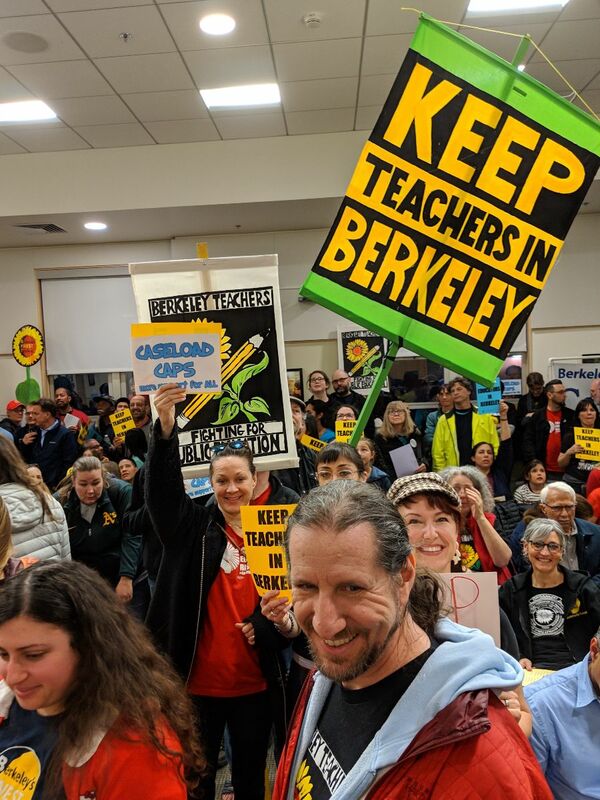 Negotiations between the Berkeley Federation of Teachers and the Berkeley Unified School District began on March 15th, just two days after over 450 BFT and BCCE members rallied and packed a School Board meeting in support of a strong contract. The BFT team is led by President Cathy Campbell. She has been BFT President for 12 years. Prior to her union service she was a longtime English and Social Studies teacher at Willard Middle School. The team was nominated by President Campbell and approved by the BFT Executive Board. The district’s Chief Negotiator is attorney Roy Combs of Fagen, Friedman and Fulfrost. Other members of the BUSD team are Evelyn Tamondong-Bradley, Assistant Superintendent of Human Resources; Maggie Riddle, Director of Schools; Brent Daniels, Director of Personnel; Dr. Jan Hamilton, Executive Director of Special Education; Susanne Reed, Manager of Professional Development; Natasha Beery, Manager of BSEP and Community Relations; Tom Reid, Principal, Berkeley Adult School; Maria Carriedo, Principal, Preschool Program; Paco Furlan, Principal, Rosa Parks Elementary; and Erin Schweng, Principal, BHS. BFT leaders have been preparing for negotiations since September 2018. They have collected information from members via surveys, Executive Board meetings, general membership meetings, site meetings, individual emails and phone calls, and scrutiny of the current contract and grievances. Team members have received training from the California Federation of Teachers in negotiations and have been meeting since November to prioritize and draft proposals. Sessions are currently scheduled at approximately two-week intervals. Key sessions about compensation will occur in May. There are several factors that affect the timing of the BFT proposal about compensation. The Governor’s revised budget for education may reflect increased revenue due to ongoing statewide advocacy. In addition, the full cost of BFT’s other key proposals, especially around Special Education, will become clearer. BFT is analyzing the outcomes of recent contract negotiations in the Bay Area and looking for ways to capitalize on the momentum while avoiding the pitfalls of recent labor actions, including deep cuts that disproportionately impact our classified colleagues. The term (or number of years) of the contract is another key decision that is closely linked to compensation. The BFT team wants to avoid “leaving money on the table” in a fluid political and financial environment. BFT plans to discuss compensation proposals at the April Executive Board meeting and to announce a compensation proposal in May. The Negotiations Team is committed to making a strong proposal that increases the competitiveness of our salaries and meets the needs of our members for a sustainable future as Berkeley educators. BFT will provide a Negotiations Update after each session. For more information on processes and timelines, please see the BFT Negotiations FAQ. At the initial bargaining session, BFT proposed that teachers with a proficient or distinguished rating on previous summative evaluations be allowed to participate in Alternative Evaluations for two consecutive cycles. This would provide teachers with more opportunities to do meaningful professional development and make presentations to colleagues. BFT proposed that four of the eleven sick days granted each year be designated as truly personal leave. Under the BFT proposal the employee would not be required to provide any reason about the need for the absence, allowing privacy for sensitive issues and the ability to meet personal and family needs within the context of the school calendar. BUSD proposed to extend deadlines for evaluations and post-evaluation conferences when teachers or evaluators are absent. The district also proposed to reduce the time some vacant positions must be posted from five days to three in order to streamline hiring. THANK YOU TO ALL THE MEMBERS AND SUPPORTERS WHO CAME OUT TO THE MARCH 13TH SCHOOL BOARD MEETING! Following a march, rally, music and pizza, over 450 BFT and BCCE members packed the Board meeting room and overflowed into the patio. The energy, creativity, commitment and unity of our members was on full display. Powerful speeches by BFT members and community supporters highlighted the need for BIG improvements in our compensation and more support for our full inclusion program through caseload caps. President Cathy Campbell spoke forcefully of our members’ fierce commitment to our profession and to public education and the absolute necessity of making our salaries competitive so that teachers can make a career of teaching Berkeley students. You can see photos and read Campbell’s full speech here. The BFT and BUSD teams will meet again for an all-day session on Monday, March 25th.